You know, I'm always on the look out for easy project ideas. And, I have a short attention span. What was I saying? Oh, the picture, right. Recently I was reading The Nester (which is an amazing "easy-peasy" beautiful decorating site) and she had a guest poster, The Remodeling Guy. 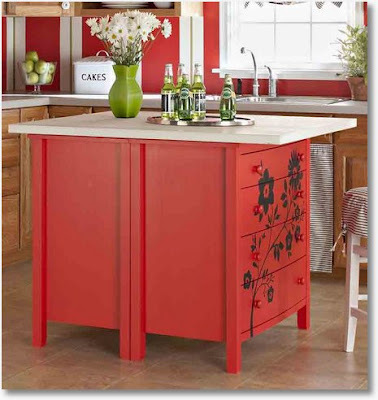 I hopped over to his blog to see the kitchen island above - with directions on how to (possibly) get that done in a day - by using -get this - dressers from Goodwill. Now, the only thing I like better than...easy creative ideas...is saving money! So, I quickly added The Remodeling Guy to my iGoogle page, AND I became a "fan" at his Remodeling Guy Facebook Page, too. I love the kitchen (dresser) island idea. Hope you do, too. What is your favorite "out of box project you have done, or would like to do someday?